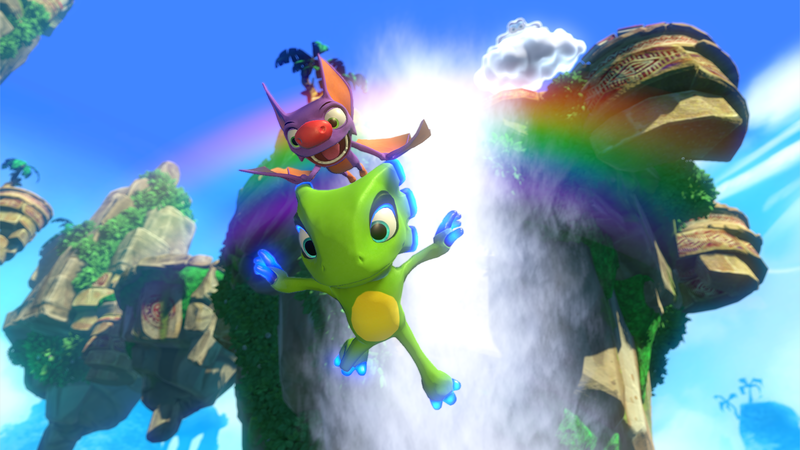 Yooka-Laylee, the Kickstarter-funded 3D platformer from Playtonic, has been delayed from the expected release of October 2016 to Q1 2017. 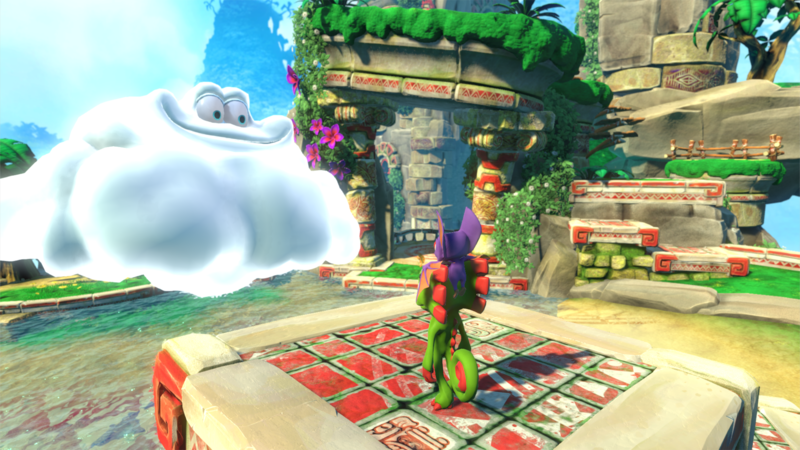 A new gameplay trailer accompanies the announcement of a delay for upcoming 3D platformer Yooka-Laylee. 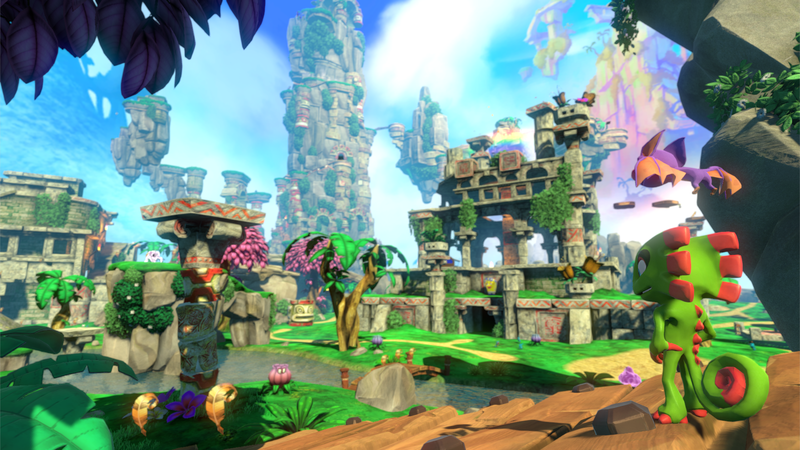 In a Kickstarter update, Playtronic announced that Yooka-Laylee has been pushed from its expected release in October 2016 to Q1 2017, writing "As well as revealing the first gameplay, this video also confirms that, after long consideration and knowing through dialogue with our backers that they value quality and polish above all, we've made the difficult decision to lock the release of Yooka-Laylee to Q1 2017." 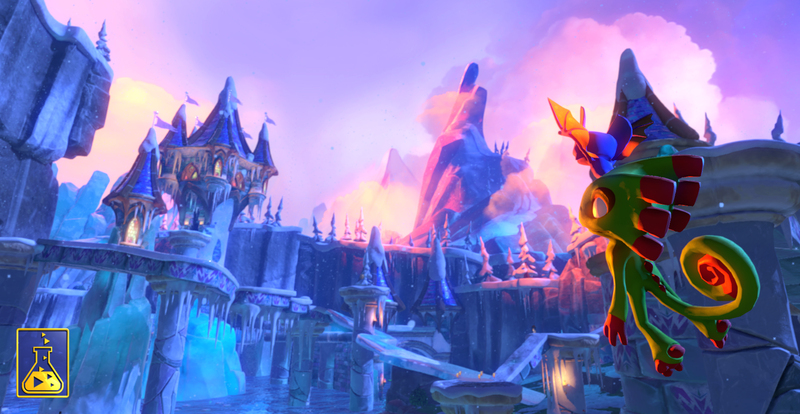 "While we felt confident we could ship the game in October as originally projected in our Kickstarter, the Playtonic team has decided that it would prefer to add a few extra months' polish to the game schedule," the post continues, adding that the delay will allow the team to deliver "a better game." 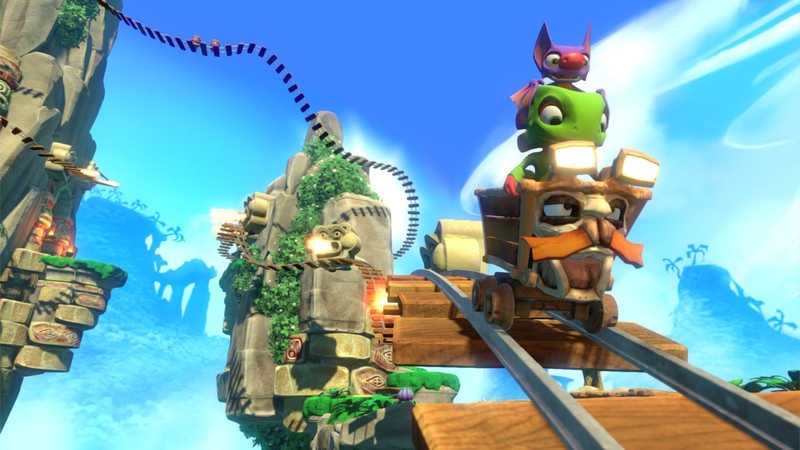 "We're sure some will be disappointed by the prospect of a few extra months' wait, however the team is confident that we've made the right decision for the game and that you'll be pleased with the results when Yooka-Laylee arrives early next year." 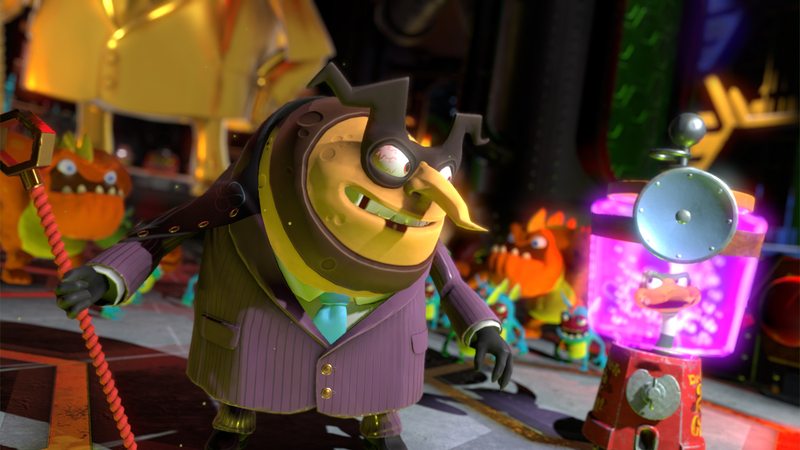 There are also new screenshots to hold you over, which you can check out below. Oh my god I want to contain myself but the hype is very palpable right now. It looks gorgeous and has some really interesting mechanics sprinkled amongst some at-least-so-far bland looking ones. No indication that I can see of what the hub world/travel system is so I can't tell whether the trailer shows just 3 separate levels because that cloud level looks to be huge. I really wish that developers would stop giving announcement dates for games that are still in active development. I get it, you want to get the hype machine rolling, but if you're not beholden to any corporate overlords then there's really no other reason. And, honestly, especially with a game like this there's going to be just as much hype next year as there would be this year, unless somebody else comes along out of nowhere and manages to steal your thunder. Anyway, it's not really disappointing insomuch as it is expected to hear that a game (particularly indie) is being delayed. Unless it turns into vaporware or pulls a Mighty No. 9, I don't see any reason to have a problem with this. The colours! The wonderful designs!! The playtonic logo that moves and shines just like the Rare logo!!! No...naughty nostalgia glands! Stop secreting so many nostalgiaphrens! I must control my urges. Still looks like Banjo Three-ie to me. That remains a very good thing. Even though I don't really have any nostalgia for the golden age of 3D platformers, because I only had little playtime with that console generation, this sort of thing is making a PS4 look mighty attractive. It looks fun, although Banjo Kazooie wasn't the best game in existence. A lot of the appreciation for that game comes down to nostalgia. Nuts and Bolts was actually warranted in how it made fun of Banjo Kazooie, considering that Banjo Kazooie really was just collectathon. Hopefully this game has a lot of substance, if the platforming elements are challenging enough, then it should be great. Having replayed both of the original games rather recently with a critical eye I can still say they hold up extremely well. They are by no means great by modern standards, but the fact that its gameplay still holds up today speaks volumes about how good it was when it was released. When all's said and done at least both games had more content than most modern games. This looks so awesome! Banjo Kazooie and Banjo Tooie are some of my favorite games of all time, especially Tooie! I've been dying for a real 3D Platforming Collectathon since the First Super Mario Galaxy, and there's no way I'm passing this up! 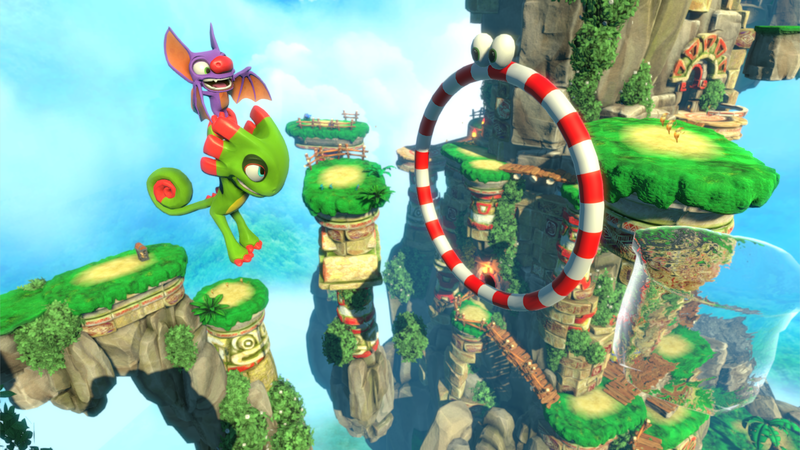 I'm kind of hoping that Yooka-Laylee gets on the NX and that it could be one of the first games I get for the system. If not, it'll have to be one of the last games I get for the WiiU (along with Kirby's Rainbow Curse). For some reason they've shown the PS branded trailer, which obviously only promotes the game for its own platform. Anyway, it's coming to Win/Linux/OSX and current gen consoles. OT: The look and feel is spot on, just closing my eyes I could've sworn the sound and music is straight from a Banjo game. Really looking forward to this. "Pfft. You can't trust this lot. It'll probably have car sections by then." Ha! Nice jab at Nuts and Bolts. I mean you could just buy it on steam given that it will also be released on PC. Interesting. I replayed both Banjo games fairly recently as well, and came to different conclusion: Kazooie is still damn near flawless, but Tooie is absolute garbage and a regression in almost every aspect of its design. Anyway, I still don't know how to feel about Yooka-Laylee. The art style, the level designs we've seen..... none of it's doing anything for me. I guess I'll just have to wait and see how this all pans out, eh? I am saddened that I won't get to play the full thing for at least another 6 months, but it does look like it's shaping up to be absolutely beautiful. I'm looking forward to the Toy box next month though. Good to see they're putting in more polish and making sure it's right. Between that and the trailer, I can live with the delay. Yeah, this, dude. I have no idea what you're talking about. At all. OP: Worlds look consistent so that's good. I don't know though if they'll be able to bring back that awesome FEEL that BK's and BT's worlds had. Like, Rusty Bucket Bay was cracked and derelict with industrial oily water whereas Gobi Desert looked scarred yet clean and of course, sand and stone everywhere under the blue sky. I guess what I'm trying to say is, each world had a theme, and in EVERY aspect of a worlds design in BK and BT stuck to that theme. And I think that's the problem these days with level design. They keep creating them and slapping in a bunch of stuff that clashes with the supposed theme of the level. Nuts & Bolts was often a perfect example of this crap. So anyway, I would keep heavily to each theme and make the worlds VAST. Even at the cost of the scale of the worlds being a little exaggerated as it was in BK and BT. Okay. So. The beef I have with Banjo-Tooie mostly comes down to its level design. Yes, Tooie's worlds are considerably bigger.... but that's not a point in its favour. Kazooie's worlds are almost all built around a "Centrepiece" in the middle - tying the geometry together in such a way that it's very easy to understand roughly where you are relative to the rest of the level at any given time. Tooie's levels are considerably larger, blander, and take far longer to traverse. There's also the fact that you spend very far too much time in Tooie doing stupid minigames (like the goddamn FPS sections), and faaaaaar too much time running around, with very little time doing any platforming. Then there's the obnoxiousness that is 'split-up' and playable Mumbo, two new mechanics solely designed to pad the game's length by forcing you to run back and forth swapping characters, in order to do things as mundane as standing on pads. DK64 is guilty of all these things too btw. It made me want to go back and play Kazooie again - a platforming game in which you spend most of your time actually doing platforming. You know, it's sad but whenever I see news nowadays that a game has been delayed my first instinct is to think "Gee, I wonder how many death threats they got after this announcement?" It's not as big a deal as you think it is to them, honestly. It's just meaningless noise; a bunch of kids or trolls or idiots. Take your pick.